Tomato, Cabbage, Squash, Pumpkin, Cucumber, Melon, Cauliflower, Kale, Potatoes, Blackcurrant, Redcurrant, White currant, Beans, Orange, Lime and Lemon. Dwarf types make good edging plants that may deter rabbits. Some varieties are known for their ability to starve out rootknot nematodes when planted as a mass. Sow marigolds in late spring, or set them out as bedding plants. In climates with long, hot summers, make a second planting in summer for great autumn colour. Broadcast seed into cultivated soil so that the seeds are about 5 cm apart and 1 cm deep. Thin to 20 cm apart in all directions for dwarf varieties; allow 30 cm between very tall varieties. 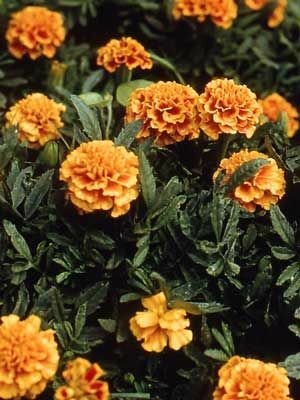 Dwarf marigolds with bi-coloured flowers and colour variations, summer flowering annual, full sun, tolerates shade, water when dry and mulch. Intolerant of frost, rich well drained soil, easily raised so sow direct in autumn and spring to early summer.